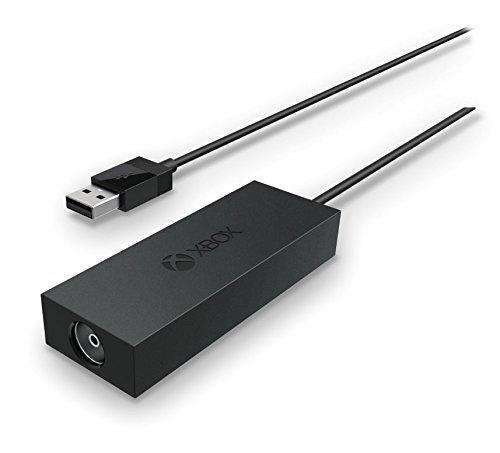 The Microsoft Official Xbox One Digital TV Tuner Xbox One is a USB accessory that makes it possible to watch the free-to-air digital TV using the Xbox One console. It supports a variety of television standards, including DVB-C, DVB-T2 and DVB-T. This means that you can use tuner to enjoy premium live television services without using a set-top box. • It allows you to enjoy your favourite TV channels without having to change TV inputs. This means that you can wait for a multiplayer match to start and receive game invitations as you watch TV. • You will be able to use apps, such as Skype, on your TV and even watch TV shows at the same time. • Get TV listings from the OneGuide, which makes it easy to keep track of your favourite shows and ensure you never miss a single episode. You can even customise the listings to make it easier to choose the shows you love. • Voice recognition allows you to start watching your desired TV channel by simply calling out its name. In addition to voice control, you can also use controls such as pause live TV, forward, rewind, and stop, via Kinect. • You get the ability to tune channels by accessing OneGuide on the Xbox SmartGlass. Setting up the Microsoft Official Xbox One Digital TV Tuner Xbox One is as easy as plugging in the USB to the Xbox One console and connecting the antennae on the other end. It is also very affordable, especially when you factor in all the features that it offers.